Suddenly I had visions of a wardrobe filled with long sleeve merino tops – warm, moisture-wicking and odour-repelling. * A few online orders later, and I had enough merino jersey meterage to begin my wardrobe plan (more on the other garments later). 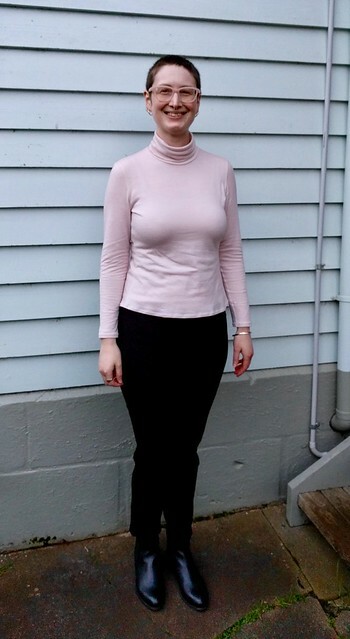 To recreate the Country Road top, I chose a 180gsm merino jersey in ballet pink from The Fabric Store – the perfect match for the Named Paola Turtleneck Tee. I have already made this pattern in a cotton/spandex blend, and am pleased to report it performs just as well in a merino knit. The only real difference in construction was using a water-soluble stabiliser when twin needling to prevent tunnelling due to the lightweight nature of the fabric. I certainly achieved the top of my dreams in style, but not performance. This is totally a rookie error – being new to sewing with merino jersey, I ordered some in 180gsm and some 200gsm weights, assuming they were adequate weights for tees. The 200gsm fabric was a dream, but 180gsm was just a bit too thin for my taste. I am really, really cold in this top! This could be down to my temperature regulation issues, but it is also pretty transparent. I rarely wear any clothing that isn’t opaque – choosing undergarments that won’t show through is such a pain. All this means that as beautiful as this top is, it just won’t get worn. Pattern details: Classic, semi-fitted turtleneck tee with full-length sleeves and a turtleneck collar. Available as a PDF download (A4 or copyshop) or a printed pattern, sizes 32-50. Other materials: Clear elastic to stabilise shoulders, from Aliexpress. Wash-N-Gone soluble stabiliser for hems. *This is really a thing. Wool can absorb up to 30% of its weight in moisture before it starts to feel wet against your skin (technical term: hygroscopic). Its natural breathability means it can whisk moisture away to regulate temperature and reduce body odour, hence its ideal use in hiking and mountaineering clothing. Damn it! If no-one else wants this, colour be damned, I’ll take it!! It’s just so damn pretty. It’s yours 🙂 I’ll send you an email! Yes I have 🙂 Thank you! I love it. Too bad it is too light to keep you warm. I also have trouble regulating my body temperature. I actually sit around 96 (35.5) when I have a normal to me body temp. Makes getting cold really bad for me. I hear you on needing something warmer. Hopefully Spring is on its way to you and you will be in much better temperature soon! Gee, you’d want to rug up where you live then! To be honest I’m dreading the warmer weather. At least if it’s cold I can rug up, but where there are days and weeks of temps around 40C with high humidity I can’t bear it. I’m not a fan of pink. But this is lovely! We all have our own different colours, don’t we? I couldn’t bring myself to wear a lot of blue, for instance. Haha and blues and reds are my favourites! Woohoo! Can’t wait to see them.